The defending champions Vidarbha won the 85th Ranji Trophy title. The defending champions defeated Saurashtra by 78 runs in the final. Aditya Sarwate of was Vidarbha was declared man of the match for his 11 wickets in the match and 49 runs in Vidarbha’s second innings which helped Vidarbha clinching the title for the second time. 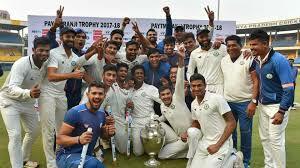 Ranji Trophy is the Indian domestic first-class cricket championship between teams representing regional and state cricket associations. Mumbai (Bombay) have won the tournament the most number of times with 41 wins. Vidarbha became the sixth team to successfully defend their title. The other sides to win the consecutive titles are Bombay/Mumbai, Maharashtra, Delhi, Rajasthan and Karnataka.